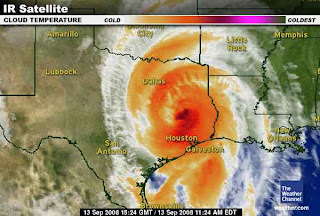 After making landfall at 2:10 am at Galveston, Hurricane Ike is gradually weakening as it moves further inland over Texas. The storm made landfall as a large Category 2 storm, and its effects are being felt far inland. At 10 am CDT, maximum winds were 80 mph, with higher gusts, and the storm is likely to remain a hurricane into Saturday afternoon. 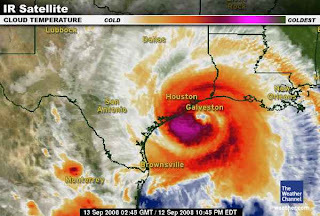 Hurricane Ike caused widspread damage, especially from coastal flooding, across the Galveston/Houston area. Hurricane force winds blasted windows out of Houston high-rise office buildings, and massive power outages affecting virtually the entire metropolitan region left as many as 4 million customers without power. The Houston mayor has appealed for water conservation in response to low pressure in the water system. Preliminary estimates indicate that Ike caused between $8 billion and $18 billion in insured losses. Hurricane force winds extend up to 45 miles, and tropical storm winds up to 230 miles, from the center. 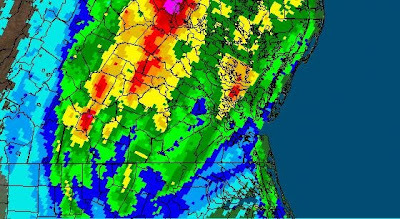 Other effects associated with the storm include very heavy rain and an increased threat of tornadoes. Ike was centered about 20 miles north northeast of Huntsville, Texas, at 11am, moving north at 16 mph. A turn more toward the northeast and an increase in forward speed should occur tonight and Sunday. 11 pm Update: Hurricane Ike has strengthened this evening to a maximum level Category 2 storm with winds up to 110 mph. The circulation structure has become more organized, and a 40-mile-diameter eye has developed. Doppler radar wind speeds in the northern eyewall have been measured as high as 130 mph at 6500 ft. Hurricane force wind gusts have been reported on Galveston Island. The center of the storm is wobbling, but it's moving generally northwest at 12 mph. From its position about 55 miles south southeast of Galveston, landfall will occur before dawn on Saturday. Water levels have already reached 9 to 12 feet above normal along a large section of coast, and storm surge up to 20 feet is likely near the center of the storm. Storm surges have been steadily increasing along the northwest Gulf Coast as very large Hurricane Ike continues to approach landfall. The Category 2 storm is being continually monitored by aircraft reconnaissance, and these measurements show the maximum wind is still 105 mph. The hurricane force winds extend out up to 120 miles, and the tropical storm force winds up to 275 miles, from the center. The storm remains on a track veering between west northwest and northwest, moving at a speed of 12 mph. At a distance of 135 miles southeast of Galveston, Ike is now about 10 to 12 hours from landfall. Tide gauges are showing water rises of 8 to 9 feet so far in the Galveston area, and storm surges are forecast as high as 15-20 feet near and to the right (north) of the landfall. 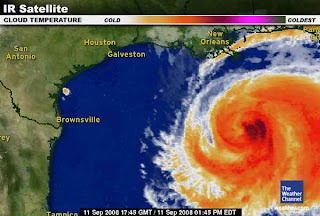 Texas Governor Perry is predicting "Hurricane Ike Could Be Costliest Ever", with a $100 billion dollar impact. This would make Ike the most expensive natural disaster in U.S. history. In anticipation of the storm's effect on refineries, wholesale gasoline prices on the Gulf Coast were as high as $4.85 a gallon today. Natural gas prices were also up, rising 2.6%. See previous posts for the earlier history on Ike. 2 pm Update: Winds and storm surge are already being felt along the Texas coast as Hurricane Ike moves closer. 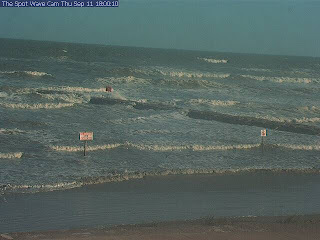 Tide gauges in the Galveston area have measured surges of 6 to 8 feet as of 11 am CDT, and sustained winds as high as 52 mph have been reported from an oil platform 35 miles offshore. Ike remains a Category 2 storm with maximum winds of 105 mph, but tropical storm and hurricane force winds continue to cover a very wide area. At 1 pm CDT, the center of the storm was moving west northwest at 12 mph from a position about 165 miles east of Galveston. 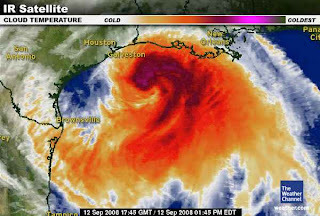 Very large Hurricane Ike continues to head toward the Texas coast. Maximum winds increased a little overnight to 105 mph. The Houston/Galveston National Weather Service Office reported that an oil platform in the northwestern Gulf observed a sustained wind speed of 109 mph at an elevation of 400 feet. At 10 am CDT, an oil platform 35 miles east of Galveston was already reporting tropical storm force winds of 46 mph. Hurricane force winds extend outward up to 120 miles, and tropical storm force winds extend up to 275 miles, from the center. The major threat from Ike is for flooding from storm surge which could be as high as 20 feet near and to the right of the storm's center. The Houston Chronicle is reporting online that water is already in the street in Galveston's Strand area. Ike's appearance on satellite is somewhat less symmetric this morning, and the maximum winds are away from the center, but additional strengthening to lower Category 3 is still possible before the storm makes landfall. The hurricane has wobbled a little to the west, but the general track remains west northwest at a forward speed of 12 mph. A turn more to the northwest later today will bring the center to a landfall very near or to the south of Galveston early on Saturday. At 10 am CDT, the center was located about 195 miles southeast of Galveston. The latest local Weather Service statements, including watches, warnings and evacuations, for affected areas from Texas through the northern Gulf are available here. 11 pm Update: There is virtually no change in the intensity or track of Hurricane Ike at 11 pm. The minimum pressure has risen slightly to 956 mb. The current location of the center is about 340 miles southeast of Galveston, Texas. On the forecast track, Ike will make landfall somewhere near Galveston in about 24 to 30 hours as a Category 2 storm. The main risk from Ike is for a very large storm surge near and to the right (north) of the center. 8 pm Update: It's sounding like a broken record, but Hurricane Ike continues to have maximum winds of 100 mph, and it's moving west northwest. The forward speed is just a little bit faster, though, at 12 mph. A slightly more northerly track is expected by late Friday. The dimensions of tropical storm and hurricane force winds also remain the same as before. 5 pm Update:Hurricane Ike continues to be a very large Category 2 storm with maximum winds of 100 mph. The storm is moving west northwest at 10 mph toward a landfall on the Texas coast Friday night. Model runs this afternoon have shifted the track of the storm more to the north, and the forecast has been adjusted accordingly. This brings the landfall closer to, but still south of, the Galveston/Houston area. Average forecast track errors at 36 hours are about 100 miles. COASTAL STORM SURGE FLOODING OF UP TO 20 FT ABOVE NORMAL TIDE LEVELS...ALONG WITH LARGE AND DANGEROUS BATTERING WAVES...CAN BE EXPECTED NEAR AND TO THE EAST OF WHERE THE CENTER OF IKE MAKES LANDFALL...EXCEPT AT THE HEADS OF BAYS...WHERE SURGE FLOODING OF UP TO 25 FT COULD OCCUR. COASTAL STORM SURGE FLOODING OF 6 TO 8 FEET ABOVE NORMAL TIDE LEVELS...ALONG WITH LARGE AND DANGEROUS WAVES...CAN BE EXPECTED WITHIN THE TROPICAL STORM WARNING AREA ALONG THE NORTHERN GULF COAST. ABOVE NORMAL TIDES IN THE EASTERN GULF OF MEXICO SHOULD GRADUALLY SUBSIDE OVER THE NEXT DAY OR SO. Complete hurricane local statements for affected Gulf Coast areas, including evacuation orders, are available here. DIRECTLY ON THE COAST WILL BE DESTROYED. WIDESPREAD AND DEVASTATING PERSONAL PROPERTY DAMAGE IS LIKELY ELSEWHERE. VEHICLES LEFT BEHIND WILL LIKELY BE SWEPT AWAY. NUMEROUS ROADS WILL BE SWAMPED...SOME MAY BE WASHED AWAY BY THE WATER. ENTIRE FLOOD PRONE COASTAL COMMUNITIES WILL BE CUTOFF. 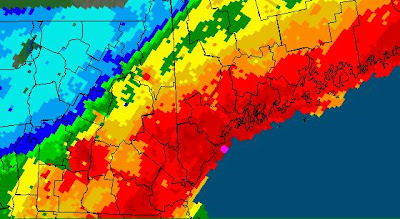 WATER LEVELS MAY EXCEED 9 FEET FOR MORE THAN A MILE INLAND. COASTAL RESIDENTS IN MULTI-STORY FACILITIES RISK BEING CUTOFF. CONDITIONS WILL BE WORSENED BY BATTERING WAVES. 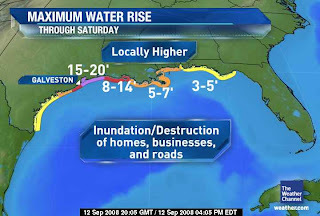 SUCH WAVES WILL EXACERBATE PROPERTY DAMAGE...WITH MASSIVE DESTRUCTION OF HOMES...INCLUDING THOSE OF BLOCK CONSTRUCTION. DAMAGE FROM BEACH EROSION COULD TAKE YEARS TO REPAIR. As of 2 pm, Hurricane Ike is still a Category 2 storm with maximum winds of 100 mph. The storm has made a slight jog to the northwest, but it's still on a generally west northwest track at 10 mph toward a Texas landfall by late Friday. The storm's circulation is very large, with hurricane force winds extending up to 115 miles and tropical storm winds extending outward 275 miles. See the previous post for why Ike's IKE (integrated kinetic energy) matters. WeatherUnderground has posted projections of worst-case storm surge scenarios for various locations along the Texas coast. As we've been pointing out here since shortly after Hurricane Ike emerged into the Gulf of Mexico, this is one humungous storm in physical size, if not in intensity. Jeff Masters has a very interesting analysis in his blog this morning of the coincidentally-named IKE (Integrated Kinetic Energy) of Ike. 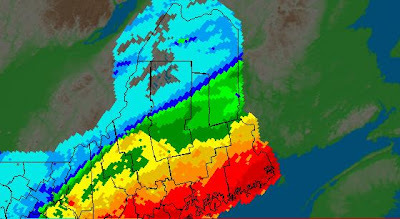 Simply put, this is a measure of the total wind force being generated by the entire storm. 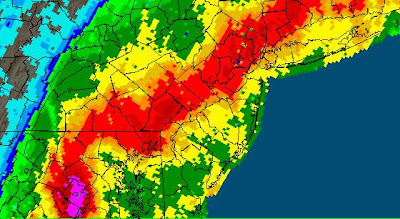 On a scale of 0-6 for the potential surge-wave damage rating, Ike gets a value of 5.6 this morning. 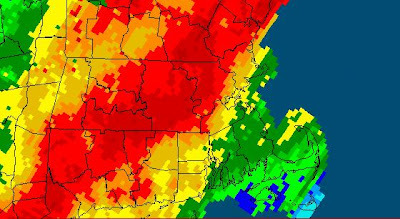 That reading is higher than any Atlantic storm in the last 40 years. At their peaks, Katrina and Wilma were both 5.1. 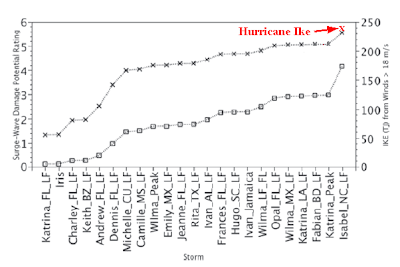 Ike's IKE value is 50% higher than Katrina's at landfall in Mississippi. If Ike strengthens any further, as forecast, the potential for storm surge damage is very high. Hurricane warning from Morgan City, Louisiana westward to Baffin Bay, Texas. Tropical storm warning from Baffin Bay to Port Mansfield, Texas. Hurricane Ike remains a Category 2 storm with maximum winds of 100 mph as it moves toward the northwestern Gulf of Mexico this morning. Ike has an unusual structure, since the lowest pressure of 946 mb would normally be associated with at least a strong Category 3 storm. The inner core is small, with an eye only 10 miles in diameter, but the area of strong winds is large, especially in the northern half of the storm. Hurricane force winds extend as far as 115 miles from the center, and tropical storm force winds extend up to 255 miles. Ike's expected track will miss some of the warmest water in the Gulf, but it is still forecast to become a major hurricane before landfall. IN THIS CASE IT IS PARTICULARLY IMPORTANT NOT TO FOCUS ON THE EXACT FORECAST TRACK SINCE DAMAGING WINDS EXTEND SO FAR FROM THE CENTER. 11 pm Update: Reconnaissance measurements show that Hurricane Ike's maximum winds remain at 100 mph, but the pressure continues to drop, indicating that further strengthening is likely. The storm also continues to move more to the northwest than predicted, but a turn to the west northwest is expected overnight. The forecast track has been shifted a little to the north, but this is still a very large storm. The National Hurricane Center says, "Everyone in the hurricane watch area has about the same risk of hurricane conditions." 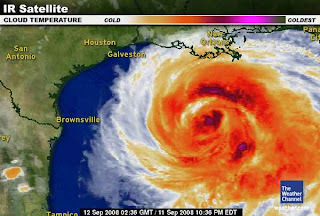 Hurricane Ike remains a Category 2 storm with maximum winds of 100 mph. The storm is still moving northwest at 8 mph from a position 720 miles east of Brownsville, Texas. The recent shift northward in the track means that Ike will miss one of the warm water eddies in the Gulf, but all intensity models are predicting that Ike will become a major hurricane in the next couple of days. The official forecast has been increased slightly to a peak of Category 4 in 48 hours. The track models are waffling on the strength of the high pressure ridge to the north of the storm, so the forecast track has been shifted a little to the north. The predicted landfall is near the center of the Texas coast, but this is a very large storm, so a wide area of coastline is likely to be affected. 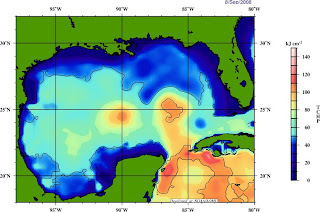 Jeff Masters points out in his blog that the shallow Continental Shelf off the Texas coast is susceptible to large storm surges. A storm of this size and expected intensity is capable of generating a storm surge of 10-15 feet for a distance of 100 miles to the north of the center. 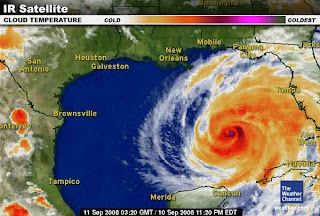 Hurricane Ike has continued strengthening today and is now a Category 2 storm with maximum winds of 100 mph. It's likely to reach Category 3 within the next 24 hours. Ike is also a large storm; hurricane force winds extend up to 80 miles, and tropical storm force winds up to 205 miles, from the center. The fringes of the circulation reach from the Yucatan Peninsula on the south to northern Florida. The storm is moving northwest at 8 mph, but a more westward turn is expected. This would put Ike on track for a landfall on the Texas coast late Friday night or early Saturday. At 2 pm, the center was 255 miles west of Key West, Florida and 395 miles south southeast of the mouth of the Mississippi. Noon Update: The output from a major global model, known as the GFS, is just now being generated from this morning's data. It shows Ike on track to make landfall on the south-central Texas coast near Corpus Christi Saturday morning (map shown to the right). 11 am Update: Hurricane Ike continues to strengthen. Maximum winds at 11 am are 90 mph. The radius of strong winds has also expanded: 80 miles for hurricane force and 205 miles for tropical storm force. The storm has been moving very little in the last few hours, but it's expected to resume a west northwest course this afternoon. 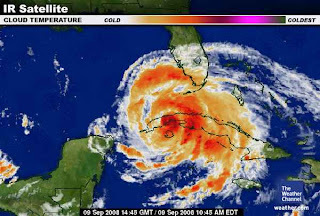 At 8 am, Hurricane Ike was centered 145 miles north of the western tip of Cuba. It was moving northwest at 8 mph, but a west northwest track is likely later on today. The forecast track continues to take the storm across the central and western Gulf of Mexico toward a landfall on the Texas coast. The intensity forecast is more uncertain, but the storm is likely to be a major hurricane at landfall. 11 pm Update: Hurricane Ike has already started strengthening in the southeastern Gulf of Mexico. Aircraft measurements put the maximum wind speed at 80 mph, but satellite views of a sharpening eye and deepening convection indicate that further intensification is underway. The storm is still forecast to become a major hurricane (Category 3 or higher) before it makes another landfall in about three days. The landfall target is still quite wide; it includes the entire Texas coast. Current motion is toward the west northwest at a reported speed of 9 mph, although movement has been somewhat slower over the last several hours. At 11 pm, the center was 120 miles west of Havana, Cuba. 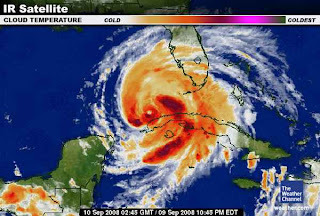 Minimal Category 1 Hurricane Ike has emerged from western Cuba into the southeastern Gulf of Mexico. The encounter with land over the last couple of days has knocked the storm's maximum winds down to an estimated 75 mph, but the circulation pattern, including the inner core, is intact. A reconnaissance flight is currently attempting to refine the estimate. The storm will be moving over a couple of areas of very high heat content in the Gulf, and the upper air pattern is expected to be very favorable, so the chances that Ike will again be a major hurricane in the next few days are quite high. Two major models are forecasting Ike to be at Category 4 in the central and western Gulf. Ike is continuing to move west northwest, but at a slower rate of 10 mph. The computer models have been coming into better agreement on Ike's track in the western Gulf. They are taking the storm more to the north than earlier forecasts, and the official track has been adjusted to reflect this. There is still a wide margin of error on the landfall prediction, but the central Texas coast between Corpus Christi and Galveston is looking like the most probable target late Friday or early Saturday. 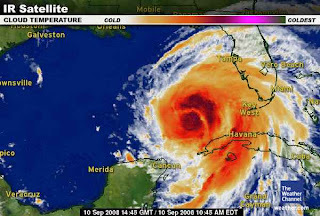 At 10:30 this morning, Hurricane Ike made a second Cuban landfall. The center of the storm crossed the south coast of western Cuba in extreme southeastern Pinal Del Rio province. Ike is continuing to move west northwest at 13 mph from a position 55 miles southwest of Havana. On this track, the hurricane will cross western Cuba and emerge into the Gulf of Mexico this afternoon. Reconnaissance data indicate that Ike is a Category 1 storm with maximum winds of 80 mph, although recent satellite images imply a stronger storm. Models show a wide range of strengthening in the next several days, but Ike is likely to be a major hurricane in the Gulf. 8 pm Update:Hurricane Ike continues to move along the southern coast of Cuba. The storm is now heading west northwest at 12 mph. It's still a Category 1 storm with maximum winds of 80 mph. As of the latest advisory, the center of Ike was located 35 miles south southeast of Cienfuegos, Cuba, and 165 miles east southeast of Havana. 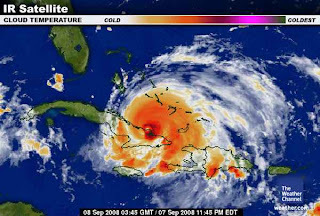 Hurricane Ike has weakened from its encounter with Cuba to a Category 1 storm. Aircraft reconnaissance has measured the maximum winds at 80 mph. At 5 pm, the center was located 45 miles southeast of Cienfuegos, Cuba, and 215 miles southeast of Havana. Ike continues to move westward along the southern coast of Cuba. The current track is west at 14 mph, but a much-anticipated turn to a slightly more northerly direction is still expected tonight. Computer models have been trending toward a stronger high pressure ridge to the north once Ike is in the Gulf of Mexico. This implies a more southerly track in the direction of a landfall on the central Texas Gulf coast, and the official forecast has been adjusted accordingly. Scroll down to the previous post for Hurricane Ike videos. 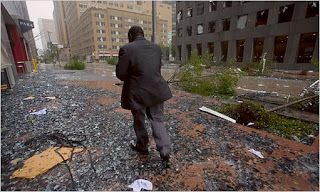 Reuters video, via N.Y. Times, shows a wave breaking over a multi-story apartment building: Click here. 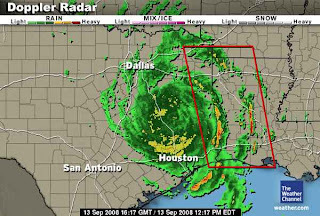 2 pm Update:At 2 pm, Hurricane Ike was back over water, centered 80 miles west of Camaguey, Cuba and 250 miles east southeast of Havana. Ike remains a Category 2 storm with maximum winds of 100 mph. A reconnaissance flight is enroute to measure the strength more directly. 1 pm Update: It appears from satellite and Cuban radar imagery that the center of Hurricane Ike has emerged over the Caribbean Sea off the south coast of Cuba. 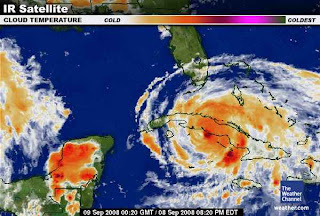 Hurricane Ike has crossed eastern Cuba and is continuing westward near the southern coast of the island. The storm has weakened somewhat over land, but it is still a Category 2 hurricane with maximum winds estimated from radar and satellite at 100 mph. A reconnaissance flight is scheduled for this afternoon to better determine the current strength. Ike is moving west at 14 mph from a position 45 miles west southwest of Camaguey, Cuba. The current track will take the storm along or near the southern coast of Cuba and then across the western end of the island and into the Gulf of Mexico, where some restrengthening is likely. Ike's exact path in the Gulf depends on the interaction between the storm and several upper level circulation features to the north. At this point, a landfall anywhere from Brownsville, Texas to Mobile, Alabama is possible, but the most likely target is the upper Texas coast in the vicinity of Houston/Galveston. Some models are trending further east, however, so western Louisiana is certainly not out of the question. Ike's passage across Cuba is causing major damage to buildings, agriculture, and infrastructure, especially the electrical grid. Dr. Jeff Masters predicts that Ike will be one of the five most damaging storms in Cuban history. Although it will be approaching from the land side, Ike's path is likely to take it very near Havana on Tuesday. 2 am Update: Hurricane Ike is now centered just inland from the Cuban coast. The center is in the province of Las Tunas, 85 miles east of Camaguey. Maximum winds are still 120 mph. 11 pm Update: Hurricane Ike is now on the northern coast of eastern Cuba. At 11 pm, the center was just west of Cabo Lucrecia, or about 135 miles east of Camaguey, Cuba. Maximum winds are still near 120 mph. Ike continues to move toward the west at 13 mph. A west to west northwest track is expected for the next day or two, taking the storm to near western Cuba by Tuesday. 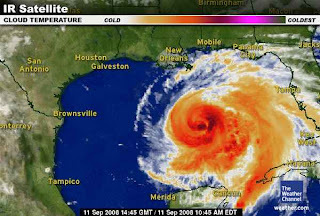 Click here for Hurricane Ike photo slideshow. 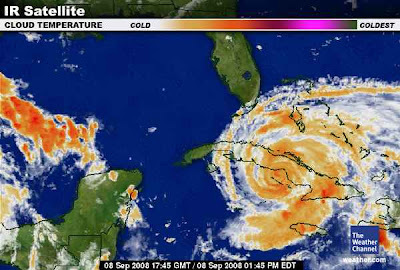 Hurricane Ike weakened a little this afternoon as it approached eastern Cuba. Aircraft reconnaissance found maximum winds of 120 mph. This puts the storm at Category 3 on the Saffir-Simpson scale. The strength may vary overnight, but Ike is expected to reach Cuba as a major hurricane. Some weakening will occur as the storm moves over eastern and central Cuba for 24 to 36 hours, but the amount of weakening will depend on how much time the center spends over land. Restrengthening is then likely as Ike emerges into the southeastern Gulf of Mexico. At 5 pm, the center of the storm was located about 75 miles north northeast of Guantanamo, Cuba, and it was moving west at 14 mph. Hurricane Ike leaves behind significant destruction in the Turks and Caicos Islands, Haiti, and Great Inagua Island. Flooding in Haiti from Ike has raised the known death toll from the four recent storms to 262, but that number is almost certain to rise. A Miami Herald reporter on the scene in the town of Cabaret on the road from Port-au-Prince to Gonaives witnessed "bodies on every street corner." On the Turks and Caicos Islands, 80% of the homes were reported damaged. 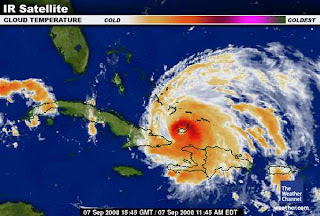 Hurricane Ike has maintained its Category 4 strength as it heads through the southeastern Bahamas toward eastern Cuba. Aircraft reconnaissance this morning has found little change in the central pressure or the maximum winds of 135 mph. At 11 am, the center of Ike was located very near Great Inagua Island in the Bahamas. The storm's generally westward track will bring it near or over eastern Cuba tonight. As Ike continues westward, the storm will weaken somewhat over Cuba, but it is expected to regain strength after it moves into the southeastern Gulf of Mexico. A Hurricane Watch has been issued for much of the Florida Keys, and evacuations have been ordered. Tropical Storm Hanna continues to race off to the northeast, leaving behind widespread heavy rains and flooding. 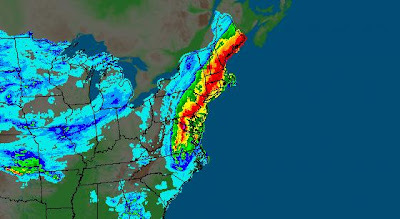 The storm has now lost its tropical characteristics as it moves northeast at 36 mph toward the Canadian Maritimes. Heavy rainfall warnings are in effect for New Brunswick, portions of Nova Scotia, and Newfoundland. The center was located about 60 miles north of Chatham, Massachusetts at 11 am. On its current track, the remnants of Hanna will pass over Nova Scotia and Newfoundland and on into the North Atlantic, reaching a position northwest of Ireland late in the week.